Ohio sophomore Cameron Odom (3) slips past a UMass defender for a first down, during the Bobcats’ non-conference victory on Sept. 29 in Athens, Ohio. 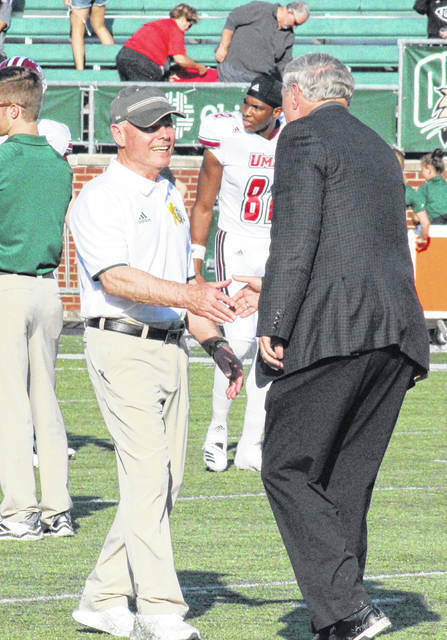 Bobcats head coach Frank Solich (left) is greeted by Ohio University President Duane Nellis (right), following Ohio’s victory over UMass on Sept. 29 in Athens, Ohio. KENT, Ohio — No matter the margin, a win is a win. The Ohio football team escaped Dix Stadium with a 27-26 victory over Mid-American Conference host Kent State, on Saturday afternoon in Portage County. Ohio (3-2, 1-0 MAC) fell behind by seven points just 10 seconds into play, as Kent State’s (1-5, 0-2) first offensive play was a 75-yard touchdown pass from Woody Barrett to Isaiah McKoy. After a Bobcats punt, the Golden Flashes covered 80 yards in 10 plays and went ahead 14-0 with a one-yard touchdown pass from Barrett to Mike Carrigan. OU cut the KSU lead in half with a 10-play, 66-yard drive that was capped off by a one-yard touchdown run by A.J. Ouellette. Louie Zervos made his first of three extra point kicks, making the score 14-7 with 2:48 left in the first quarter. The next eight possessions of the game resulted in two punts and two turnovers from the hosts, as well as one punt and three turnovers by the Bobcats. Matthew Trickett — who was 2-for-2 on point-after kicks in the opening period — made a 49-yard field goal on the final play of the first half, giving the Flashes a 17-7 lead at the break. Ohio fumbled the ball away on its first possession of the second half, and Trickett made the KSU lead 20-7 with a 39-yard field goal at the 9:33 mark of the third. The Bobcats ended a five-drive scoreless spell with 6:32 to go in the third quarter, when Nathan Rourke connected with Andrew Meyer for a 59-yard scoring pass, cutting the deficit to six points. The Flashes covered 54 yards in 11 plays before settling for a 38-yard Trickett field goal with 1:11 to go in the third, making the lead 23-14. Ohio took the game into the fourth quarter on its next possession, and Ouellette cut the margin to two points with a five-yard touchdown run with 12:45 to go. Kent State took 7:28 off the game clock with a 16-play, 64-yard drive, but yet again was forced to settle for three, as Trickett made a 28-yard field goal with 5:12 left. The Bobcats began their game-winning drive from their own 19, and converted a third down early in the possession. After a five-yard run by Rourke, a personal foul against the Flashes put Ohio into KSU territory. Rourke found Odom and Ouellette for first downs and then Ouellette put the Bobcats down to the KSU eight with a six-yard carry. On the very next play, Rourke scampered into the end zone for the go-ahead touchdown. The Bobcats’ two-point conversion attempt was stuffed, as Kent State kept its first deficit of the day at one point. The hosts made it into Bobcat territory, before a two-yard loss and a false start sent them back to their own 46. Ohio junior Javon Hagan intercepted a KSU pass with 1:58 to play, sealing the Bobcats’ 27-26 victory. The win is No. 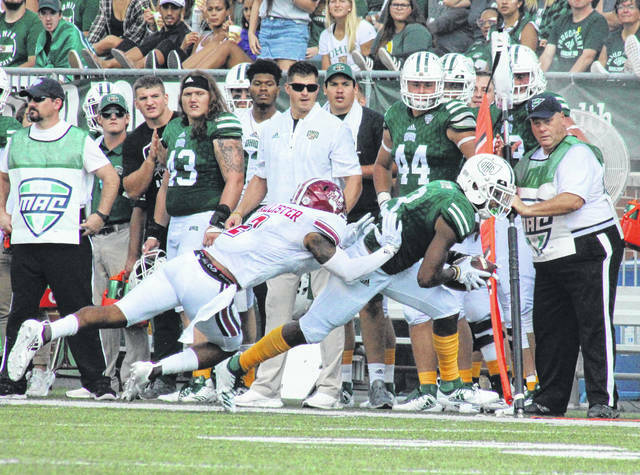 100 for Frank Solich with the Bobcats, and the 14th-year head coach acknowledged it wasn’t the easiest of the triumphs. In addition to Solich’s 100 wins at Ohio, he also recorded 58 victories in six seasons at Nebraska. The Bobcats claimed a 25-to-23 edge in first downs in the win, with both teams converting six third downs and one fourth down, and both teams punting twice. Kent State outgained the guests by a 472-to-414 count, including 201-to-130 on the ground. KSU was penalized 11 times for 100 yards, while OU was sent back 61 yards on six flags. Ohio lost the turnover battle by a 4-to-3 tally. Rourke — who carried the ball 15 times for a total of 49 yards and a touchdown — was 18-of-20 passing for 284 yards and one touchdown. Rourke’s completion percentage of 90 set a new Ohio record, surpassing Tyler Tettleton’s five-year old mark of 86.7. Ouellette led the guests on the ground with 72 yards and two touchdowns on 18 carries, while catching three passes for 32 yards. Meyer hauled in four passes for a career-best 90 yards, and one touchdown, Papi White caught five passes for 89 yards, while Odom had four receptions for 59 yards. Connor Brown and Julian Ross had a reception apiece, earning eight and six yards respectively. Along with Hagan, Marlin Brooks also picked off a pass for the OU defense. Evan Croutch had 11 tackles, Hagan added 10, with both players earning nine solo stops. Will Evans and Kent Berger each had a sack in the win, with Evans coming up with a team-best two tackles for a loss. Jared Dorsa earned a forced fumble in the win, with Brooks recovering for his second takeaway. For Kent State, Barrett was 27-of-35 passing for 271 yards and two touchdowns, while rushing 12 times for 61 yards. McKoy led the KSU receiving unit with eight receptions, 118 yards and a touchdown, while Justin Rankin led the team on the ground with 123 yards on 16 totes. Nick Faulkner had an interception for the hosts, while Jordan Silva and Theo Majette earned a sack apiece. Keith Sherald and Jim Jones both forced a fumble in the setback, while Silva, Matt Harmon and Trey Harrell each scooped a loose ball. The Bobcats have now won five consecutive matchups with the Flashes. Ohio heads to the MAC West next, as the Bobcats visit Northern Illinois for a 3:30 kickoff on Saturday.